traditional Dalmatian courtyard and a laid-back atmosphere. 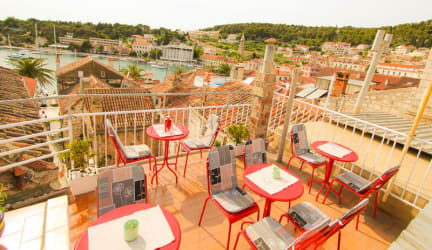 Best hostel in Hvar! Go there, you Will not be disappointed! Probs to the owner! I loved this little hostel in one of the first buildings in Hvar! The location is perfect right behind the boulevard in the middle of the town! Rino and his mother and such sweet persons and will help you to organise anything. Thanks for having us Rino BTW... best matrasses I've slept on during my whole trip in Croatia! Hele schone kamer en badkamer, hele fijne eigenaar en een top locatie in Hvar. Het uitzicht vanaf het dakterras was fantastisch! The location of the hostel is good. The room is dark though. The staffs are always not there when we just arrived and need help.